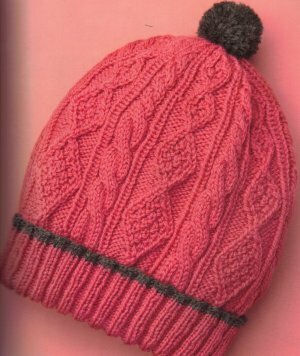 Taken from 60 More Quick Knits: "Take a trip down a double black diamond trail in this bobbled-and-cabled hat." This pattern is from 60 More Quick Knits, pg 62 - Cabled Ski Cap. Finished Measurements: 21" head circumference. Gauge: 27 sts over 4"
Colors shown are #7805 Flamingo Pink & #8400 Charcoal Grey. These colors are currently unavailable, but check out the options we have listed below! $15.75 -- Kit price including yarn only (no book or pattern).